Mary Ann Nyberg (February 7, 1923 – September 19, 1979) was an American costume designer who was nominated for two Academy Awards. A costume designer is a person who designs costumes for a film, stage production or television. The role of the costume designer is to create the characters' outfits/costumes and balance the scenes with texture and colour, etc. The costume designer works alongside the director, scenic, lighting designer, sound designer, and other creative personnel. The costume designer may also collaborate with hair stylist, wig master, or makeup artist. In European theatre, the role is different, as the theatre designer usually designs both costume and scenic elements. Both nominations were in the category of Best Costumes-Color. 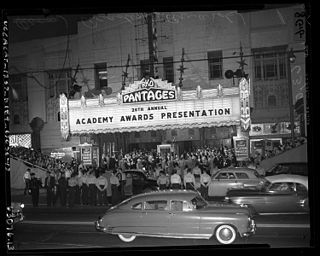 The 26th Academy Awards ceremony was held on March 25, 1954. It took place at the RKO Pantages Theatre in Hollywood, and the NBC Century Theatre in New York City. The Band Wagon is a 1953 American musical-comedy film directed by Vincente Minnelli, starring Fred Astaire and Cyd Charisse. It tells the story of an aging musical star who hopes a Broadway show will restart his career. However, the play's director wants to make it a pretentious retelling of the Faust legend and brings in a prima ballerina who clashes with the star. Along with Singin' in the Rain (1952), it is regarded as one of the finest of the Metro-Goldwyn-Mayer musicals, although it was only a modest box-office success on first release. The Robe is a 1953 American Biblical epic film that tells the story of a Roman military tribune who commands the unit that is responsible for the Crucifixion of Jesus. The film was released by 20th Century Fox and was the first film released in the widescreen process CinemaScope. Like other early CinemaScope films, The Robe was shot with Henri Chrétien's original Hypergonar anamorphic lenses. 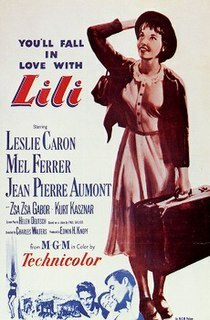 Lili is a 1953 American film released by MGM. It stars Leslie Caron as a touchingly naïve French girl whose emotional relationship with a carnival puppeteer is conducted through the medium of four puppets. The screenplay by Helen Deutsch was adapted from "The Man Who Hated People", a short story by Paul Gallico which appeared in the October 28, 1950, issue of The Saturday Evening Post. Carmen Jones is a 1954 American musical film starring Dorothy Dandridge and Harry Belafonte, produced and directed by Otto Preminger. The screenplay by Harry Kleiner is based on the lyrics and book by Oscar Hammerstein II, from the 1943 stage musical of the same name, set to the music of Georges Bizet's 1875 opera Carmen. The opera was an adaptation of the 1845 Prosper Mérimée novella Carmen by Henri Meilhac and Ludovic Halévy. A Star Is Born is a 1954 American musical film written by Moss Hart, starring Judy Garland and James Mason, and directed by George Cukor. Hart's screenplay is an adaptation of the original 1937 film, which was based on the original screenplay by Robert Carson, Dorothy Parker and Alan Campbell, and from the same story by William A. Wellman and Carson, with uncredited input from six additional writers—David O. Selznick, Ben Hecht, Ring Lardner Jr., John Lee Mahin, Budd Schulberg and Adela Rogers St. Johns. In 2000, the 1954 film was selected for preservation in the United States National Film Registry by the Library of Congress as being "culturally, historically, or aesthetically significant." The film ranked #43 on the American Film Institute's 100 Years...100 Passions list in 2002 and #7 on its list of greatest musicals in 2006. The song "The Man That Got Away" was ranked #11 on AFI's list of 100 top songs in films. Douglas G. Shearer was a Canadian American pioneering sound designer and recording director who played a key role in the advancement of sound technology for motion pictures. He won seven Academy Awards for his work. In 2008, he was inducted into Canada's Walk of Fame. The 27th Academy Awards honored the best films released in 1954. The Best Picture winner, On the Waterfront, was produced by Sam Spiegel and directed by Elia Kazan. It had twelve nominations and eight wins, matching two other films, Gone with the Wind (1939) and From Here to Eternity (1953), though those each had thirteen nominations. Sound recordist Leslie I. Carey first hit Hollywood in 1938, where he embarked on the first of over 300 films. Some of these were A Double Life in 1947, The Naked City and Abbott and Costello Meet Frankenstein in 1948, Winchester '73 in 1950, Creature from the Black Lagoon and Magnificent Obsession in 1954, Man Without a Star and This Island Earth in 1955, The Incredible Shrinking Man (1957) and Operation Petticoat (1959). Also in the late 1950s, he worked extensively on the "Peter Gunn" TV series. Nominated six times for the Academy Awards, he won an Oscar in 1954 for The Glenn Miller Story. Gordon Jennings, A.S.C. was an American special effects artist. He received seven Academy Awards and was nominated for eight more in the same category. After starting 1919 in Hollywood as camera assistant he worked from 1932 until 1953 on the visual and special effects of more than 180 films. His older brother was cinematographer Devereaux Jennings (1884-1952), who filmed, for instance, Buster Keaton's monumental The General in 1926. Norma Koch was an American costume designer, usually credited as Norma, who won the Oscar for the film What Ever Happened to Baby Jane? in the category Best Costume design-Black and White during the 1962 Academy Awards. Howard Shoup was an American costume designer who received 5 Academy Award nominations. Grant Major is an Art director from New Zealand who is most famous for his work on The Lord of the Rings films. He won an Oscar for The Lord of the Rings: The Return of the King. Bill Thomas was an American Academy Award-winning costume designer who had over 180 credits. He is perhaps best known for films like Babes in Toyland, Spartacus and The Happiest Millionaire. He was nominated 10 times. Ralph Jester was an American costume designer. He was educated at Yale, where he was an editor of campus humor magazine The Yale Record. He is perhaps best known as one of the costume designers of The Ten Commandments. John Jensen was an American costume designer who was nominated for 2 Academy Awards. Janet Patterson was an Australian costume designer and production designer. She won one BAFTA award and four Australian Film Institute awards, and was nominated for four Academy awards. Donfeld was an American costume designer who was known for his work on films such as Spaceballs, Prizzi's Honor and The Great Race. James E. Newcom was an American film editor who had over 40 films during his long career. Richard Yuricich is a three-time Academy Award-nominated special visual effects artist. His brother Matthew Yuricich was a special effects artist as well. Yuricich is of Croatian descent. Eustace Lycett was a British special effects artist who worked on attractions at Disneyland from the 1960s, such as Great Moments with Mr. Lincoln and Rocket to the Moon, as well as contributing to Disney animation. Judy Moorcroft was a British costume designer who had two Academy Award nominations as well as three BAFTA nominations. Bob Ringwood is a British costume designer who has been nominated for two Academy Awards. He is perhaps best known as the one who made the Batsuit in the 1989 version of Batman. René Hubert was a Swiss costume designer. He was nominated for two Academy Awards for his work on costumes. ↑ "The 26th Academy Awards (1954) Nominees and Winners". oscars.org. Retrieved March 18, 2014. ↑ "The 27th Academy Awards (1955) Nominees and Winners". oscars.org. Retrieved 2011-08-20.